Amy Soup joined the King’s Camps and Fitness affiliate team in 2017. After Amy got burned out by jet-setting around the world by working 80+ hours for several global corporations, she decided that she’s had enough. She has since dedicated her new life in fitness by getting healthier and stronger. She first became aware of Obstacle Courses Races back in 2013 and has since participated in over 30+ events across the United States with Tough Mudder, Spartan, Terrain Race, Rugged Maniac, and Gladiator Run. In 2016, she’s obtained 7 Spartan Trifectas. 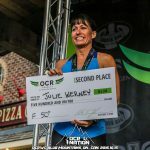 She has qualified for the 2017 OCR World Championship at Blue Mountain in October. Amy is also a member of the Spartan Street Team.